Conditional formatting is a feature of Excel which allows you to apply a format to a cell or a range of cells based on certain criteria. 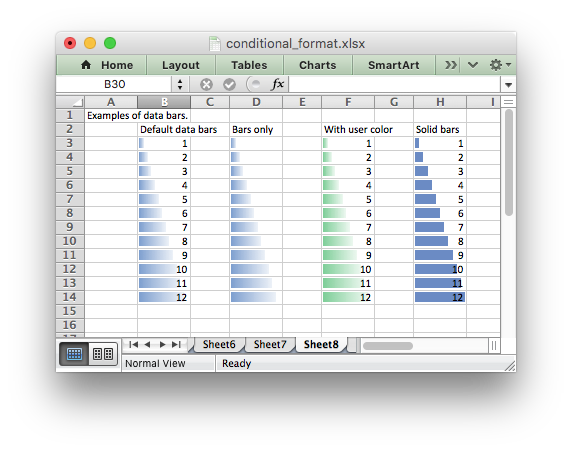 The conditional_format() worksheet method is used to apply formatting based on user defined criteria to an XlsxWriter file. 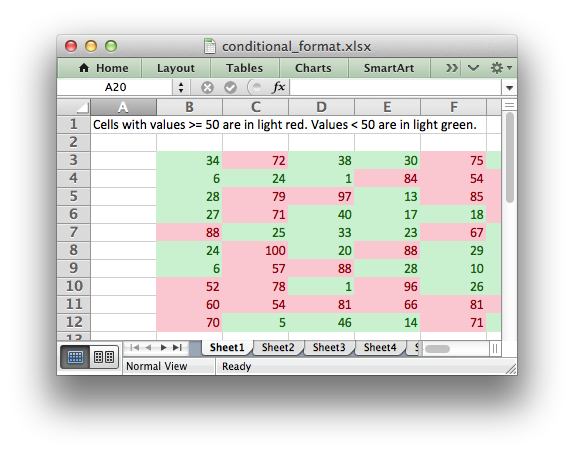 The conditional format can be applied to a single cell or a range of cells. As usual you can use A1 or Row/Column notation (Working with Cell Notation). The conditional format options that can be used with conditional_format() are explained in the following sections. 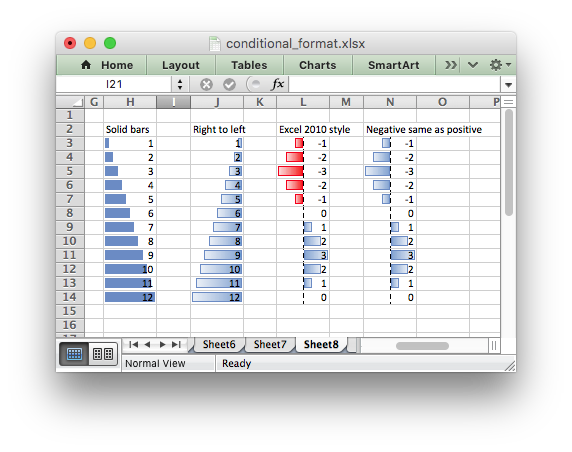 Data bar parameters marked with (*) are only available in Excel 2010 and later. Files that use these properties can still be opened in Excel 2007 but the data bars will be displayed without them. 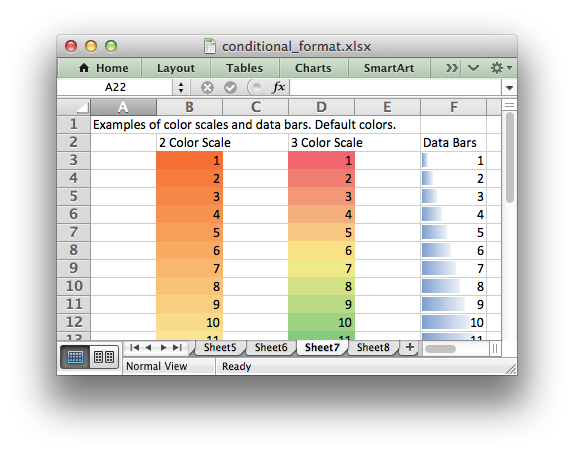 This is the most common conditional formatting type. It is used when a format is applied to a cell based on a simple criterion. Other types are shown below, after the other main options. You can either use Excel’s textual description strings, in the first column above, or the more common symbolic alternatives. Additional criteria which are specific to other conditional format types are shown in the relevant sections below. In general any value property that refers to a cell reference should use an absolute reference, especially if the conditional formatting is applied to a range of values. Without an absolute cell reference the conditional format will not be applied correctly by Excel from the first cell in the formatted range. In Excel, a conditional format is superimposed over the existing cell format and not all cell format properties can be modified. Properties that cannot be modified in a conditional format are font name, font size, superscript and subscript, diagonal borders, all alignment properties and all protection properties. # Light red fill with dark red text. # Light yellow fill with dark yellow text. # Green fill with dark green text. See also The Format Class. The maximum parameter is used to set the upper limiting value when the criteria is either 'between' or 'not between'. See the previous example. The value parameter should be a string or single character. The bottom type is used to specify the bottom n values by number or percentage in a range. It takes the same parameters as top, see above. The formula is specified in the criteria. # non-English language and use of semi-colons. # This is the correct syntax. Also, any cell or range references in the formula should be absolute references if they are applied to the full range of the conditional format. See the note in the value section above. This conditional type can be modified with min_type, max_type, min_value, max_value, min_color and max_color, see below. This conditional type can be modified with min_type, mid_type, max_type, min_value, mid_value, max_value, min_color, mid_color and max_color, see below. Files that use these Excel 2010 properties can still be opened in Excel 2007 but the data bars will be displayed without them. The icons criteria parameter should be either >= or <. The default criteria is >=. The default type is percent. Note: The icons parameters should start with the highest value and with each subsequent one being lower. The default value is (n * 100) / number_of_icons. 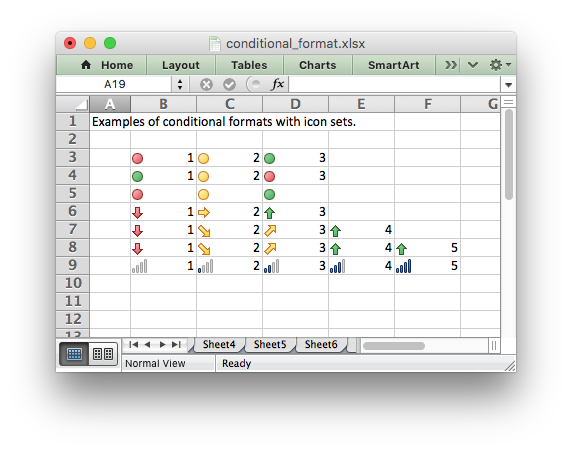 The lowest number icon in an icon set has properties defined by Excel. Therefore in a n icon set, there is no n-1 hash of parameters. Used for 3_color_scale. Same as min_type, see above. Same as min_type, see above. Used for 3_color_scale. Same as min_value, see above. Same as min_value, see above. The color can be a Html style #RRGGBB string or a limited number named colors, see Working with Colors. Used for 3_color_scale. Same as min_color, see above. Same as min_color, see above. 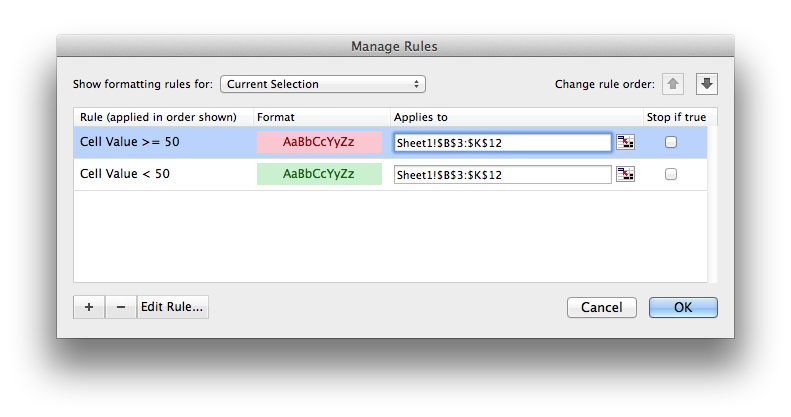 Note, this property is only visible in Excel 2010 and later. Note, this property is only visible in Excel 2010 and later, however the default in Excel 2007 is to not have a border. The multi_range option is used to extend a conditional format over non-contiguous ranges. It is possible to apply the conditional format to different cell ranges in a worksheet using multiple calls to conditional_format(). However, as a minor optimization it is also possible in Excel to apply the same conditional format to different non-contiguous cell ranges. This is replicated in conditional_format() using the multi_range option. The range must contain the primary range for the conditional format and any others separated by spaces. 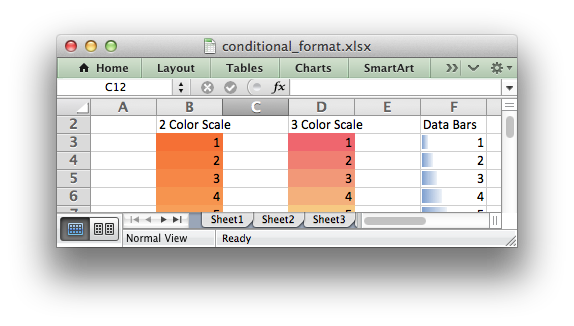 See also Example: Conditional Formatting.